Pictured (L-R): NMAAM’s H. Beecher Hicks, III, CeCe Winans, and Belmont University’s Bob Fisher. The National Museum of African American Music has announced a $250,000 donation from Belmont University, as well as its first Rivers of Rhythm Digital Exhibition. 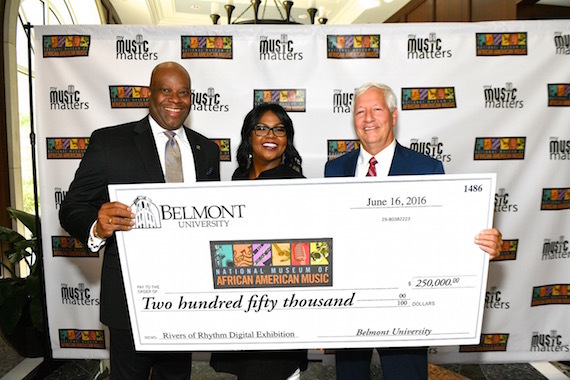 Gospel singer CeCe Winans joined Belmont University president Dr. Bob Fisher and NMAAM’s president & CEO H. Beecher Hicks, III to unveil the digital exhibition and donation. As a National Chair, Winans will focus her work with NMAAM specifically around the gospel genre and serve as an active ambassador. Winans, along with Darius Rucker, Keb’ Mo’ and India.Arie were announced earlier this year and are actively engaged in the project. All are prominently featured in the Rivers of Rhythm Digital Exhibition. The museum is expected to open in 2018 at the corner of Fifth and Broadway in downtown Nashville, according to the Nashville Post.